Eating too much meat is a common dietary problem in American society. Most Americans don't realize that they're eating too much meat. The risks of eating excessive amounts of meat include heart disease, kidney disease, osteoporosis and cancer. Here's how to tell if you're eating too much meat. Processed meats, such as hot dogs, often contain nitrate, a preservative that may become carcinogenic when heated to high temperatures during the cooking process. All meats may form carcinogenic heterocylic amines, or HCAs, during high-temperature cooking. Marinading meat in vinegar, or microwaving it before cooking, can help reduce the number of carcinogenic HCAs in meat. However, meat may also contain high levels of hormones, which can trigger reproductive problems and early-onset puberty in children. Your kidneys work to remove excess protein from your body, so eating too much protein can stress them out, leading to kidney damage and even contributing to renal failure in some cases. High dietary protein levels cause your body to excrete more calcium, which can contribute to osteoporosis. 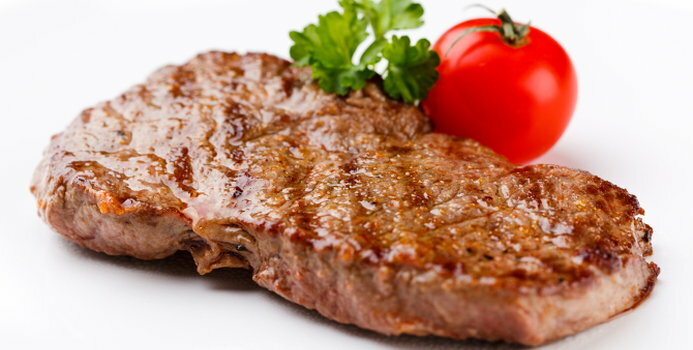 While eating too much meat can be dangerous, meat is a good source of complete proteins. Your body needs these proteins to maintain cellular tissue, so it's a good idea to eat some meat every day. The United States Department of Agriculture recommends that adults eat five to six ounces of meat per day. If you're eating more than the recommended daily allowance of meat, you should probably consider lowering your meat consumption. Red meat carries the highest risks of heart disease and cancer, so eating more poultry and pork can help lower your risk. Serve smaller portions of meat at meals. Eating higher quality cuts of meat, in smaller portions, can help curb your meat cravings without putting your health at risk. If you're eating too much meat, replace some of the meat in your diet with non-meat sources of protein. Beans, legumes, whole grains and dairy products all contain protein. Nuts, seeds, eggs and soy foods are good choices. While fish and seafood might technically be meats, they don't carry the same risks as do red meat, pork and poultry, because they are so low in saturated fats and cholesterol; fish and seafood can safely take the place of other meats in your diet. Your body needs about eight grams of protein per 20 pounds of body weight per day. You can get much of this protein from non-meat sources. Non-meat protein sources often don't contain as much saturated fat or cholesterol as meat, especially red meat. They also often contain healthy fats, vitamins and minerals that your body needs.